In Lima, Cusco and Huancayo, young people in the Alfombra Roja Movement protest against the decision to close the caseIn 1995, then-President Alberto Fujimori met with Peruvian feminists at the UN Women’s Conference in Beijing and announced he would liberalize Peru’s strict laws on contraception by allowing women to have their tubes tied without getting their husbands’ permission. For Peruvian feminists, who had been fighting for more reproductive rights against powerful opposition from the Catholic Church and Opus Dei, this was a victory. They had no idea that the Fujimori government would use the new law to forcibly sterilize three hundred thousand indigenous women in the Andes between 1995 - 2000. In the case of Peru, because most of the peasant women who were sterilized only spoke Quechua or Aymara, and many of them did not know how to name what had happened to their bodies even in their own language, it took a while for the story to reach women’s human rights advocates in Lima. In 1996, Giulia Tamayo from CLADEM, a Latin American feminist lawyers’ network, began investigating the crime and in 1999 she published a report, Nada Personal – A human’s right report about how the sterilization program has injured thousands of women. At the same time Hilaria Supa, an indigenous leader of the peasant women’s federation in the district of Anta, began to work with MAM Fundacional (Movimiento Amplio de Mujeres) and CLADEM to investigate the issue. Supa, who is fluent in both Spanish and Quechua, discovered that hundreds of women in her community had been sterilized against their wills, and founded the Asociación de Mujeres Afectadas por las Esterilizaciones Forzadas de Anta (AMAEF), organizing survivors from the communities and districts of Anta and Cusco. They were eventually able to gather testimony documenting 2047 forced sterilizations, most of which took place between1996 -1998. CLADEM found that, in most Andean communities, the Government Health Service had rounded up all the women with children and sterilized them without their consent. Some had died and a huge number had suffered adverse health consequences, their lives devastated. These sterilizations were carried out by a program ironically called Voluntary Surgical Contraception Program, under which physicians were given monthly sterilization quotas and health workers were trained to “capture” as many women for sterilization as possible. When Tamayo’s report was released on May 1999, MAM Fundacional, a women’s rights organization that helped a group of victims present their case to federal authorities, organized a press conference in Lima featuring Supa along with twelve of the sterilized women. But when they met with government health officers, the officials denied forcing women to be sterilized. It was impossible to prosecute these crimes as long as Fujimori was in power, but in 2000 feminist began to campaign for prosecution of Fujimori and his three top health officials, Eduardo Yong, Marino Cota and Alejandro Aguinaga. A case was brought in 2003. It dragged on until 2009, when prosecutor Jaime Schwartz Azpur came into office and immediately closed the case. The women’s movement appealed to the Inter-American Commission on Human Rights and, as a result, the Peruvian case was reopened in 2011. This time it seemed to be progressing smoothly - until last month, on January 22, when the new public Prosecutor Marco Guzman decided to close the case for the second time. He said the category of “crimes against humanity” fit only one individual, Mamerita Mestanza Chavez, who died - like many others - because of the state’s sterilization policy. In her case, four low-ranking doctors had already been found guilty. Interestingly, Prosecutor Marco Guzman decided to drop the case right after taking testimony from Fujimori on January 15th. He also gave the petitioners in the case only one weekend - from Thursday January 22 to Monday January 28 - to respond. Many believe he is playing politics, and was influenced by powerful interests who still support Fujimori. Certainly it would be more convenient for Fujimori supporters if the forced sterilization of thousands of women was reduced to a crime against one individual. Fujimori returned to Peru in 2006, hoping to run for re-election; in 2009 he was convicted of both corruption and massive human rights abuses committed during his campaign against the leftwing terrorist group Sendero Luminoso. But even though Fujimori is now in jail, he still has a lot of popular support; his daughter Keiko came in second in the Presidential election of 2011, losing to President Ollanta Humala in a runoff. Now Fujimori’s supporters are trying to get him freed before the next election. Another trial would not be helpful to this cause. Maria Esther Mogollón of MAM told me she suspects the Prosecutor backed down because of Fujimori’s influences in the Judicial Branch, since his involvement in this case could increase the sum of his convictions for crimes against humanity. 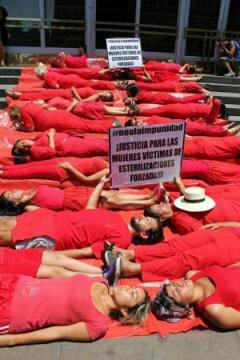 As soon as the case was dismissed, the Peruvian women’s movement challenged the Prosecutor’s report. “There was enough evidence to prove this was a crime against humanity,” Hilaria Supa said. Several organizations held sit-ins and protests in Lima and Cusco and the coordinating body for human rights in Peru (Coordinadora Nacional de Derechos Humanos), which represents 81 organizations across the country, said the case was not closed and they would continue to fight. Rossy Salazar from Demus, another women’s rights organization, told the press that, if necessary, they will appeal to the Supreme State Prosecutor's Office, and would once more take the case to the Inter-American Commission of Human Rights. The forced sterilization of hundreds of thousands of indigenous peasant women is surely as great a crime against humanity as others for which Fujimori was tried in the past. Ending impunity for this violation is essential not only to the restoration of democracy in Peru but to confirm that women’s rights really are human rights. It is time to stop playing politics with the women whose lives were blighted in such a terrible way; seventeen years has already been too long for them to wait for justice.